Bananera Noboa Exporting Company informs to the general public about the irregularities that the Internal Revenue Service has been carrying out regarding the illegal auction of the Hacienda La Clementina. 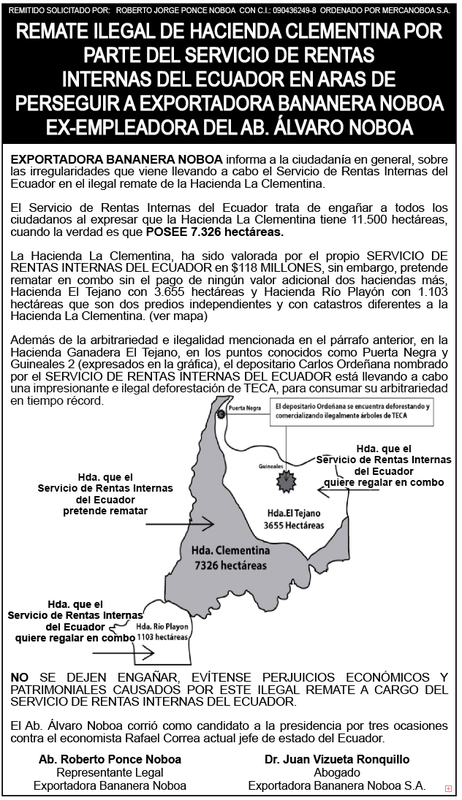 The Internal Revenue Service of Ecuador is tying to deceit all the people in Ecuador when saying that the Hacienda La Clementina has 11.500 hectares, when the truth is that the property has 7.326 hectares. The Hacienda La Cemetina has been valued by the Internal Revenue Service of Ecuador, itself, in $118 million, but the entity pretends to auction it together with two more haciendas, in a combo, without any additional payment. The properties are the Hacienda El Tejano with 3.655 hectares and the Hacienda Rio Playon with 1.103 hectares which are two independent properties with a different cadaster, in other words, not the same of the Hacienda La Clementina (see map). Also, about the arbitrariness and illegality mentioned in the previous paragraph, in the cattle farm El Tejano, in the sites known as Puerta Negra and Guineales 2 (signaled in the map), the custodian Carlos Ordeñana appointed by the Internal Revenue Service of Ecuador is carrying out and impressive and illegal deforestation of teak wood, to complete his arbitrariness in record time. Don’t let them fool you, avoid economic and patrimony damages caused by this illegal auction carried out by the Internal Revenue Service of Ecuador. 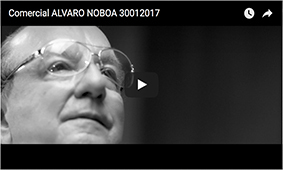 Attorney Alvaro Noboa run for President for three occasions against economist Rafael Correa, current President of Ecuador.